Hi-Fi Choice is for those passionate about music and sound. 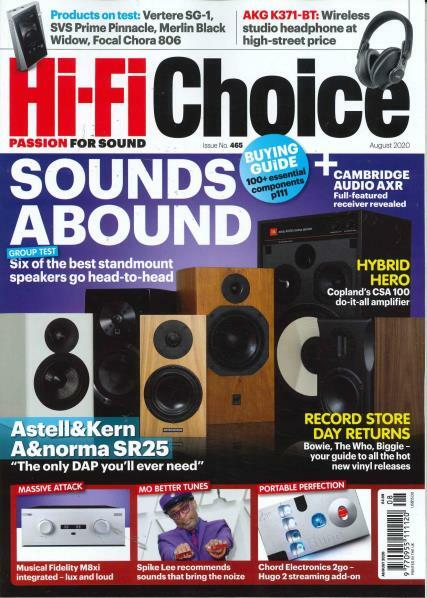 Buy a single copy or subscription to Hi-Fi Choice magazine. For the most current news and information about affordable audio products, read Hi-Fi Choice. Learn about audio equipment with interviews and articles in each issue. Find out about the latest equipment while reading the articles and interviews. Read about music fidelity or acoustics, streamers and speakers. Discover how the celebrities apply technology to get quality sound from their amplifiers and speakers. Read about one-box systems. Learn about digital-only output and the appeal of wireless. Read the reviews of equipment provided by panels of experts in the music industry. Learn about models that are worth looking into and which should be avoided. Discover the Arcam Solo Neo or the Cyrus Stream X. Learn about the Cambridge Audio NP30, the TEAC UD-H01, or the Naim ND5 SX. Each issue reviews integrated amplifiers, outboard DACs and network media players. Discover more about various types of players, all-in-one systems, tuners, and amplifiers. Loudspeakers, turntables, and more are reviewed each issue.